The original concept was developed by Jay Amble. Here is a list of the parts for the record cleaner. 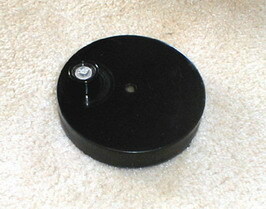 A used canister vacuum cleaner. Get one with fairly strong suction. a thrift store for only $4. vacuum but if not they are easy to find and cheap. store that cost me $8. 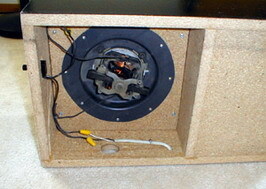 item ($25 from Audio Advisor). A record clamp. This can be easily constructed from MDF or acrylic. Record cleaning fluid. See the formula below. A squirt bottle for applying the cleaning fluid. The vacuum cleaner may be used as is. I suggest removing the vacuum bag to improve suction. The small volume of liquid pulled from the records quickly evaporates so nothing needs to be done to trap it. In my case I wanted a one piece assembly so I dissembled the vacuum and embedded the vacuum motor into my record cleaner box. This also had the unexpected benefit of being considerably quieter. 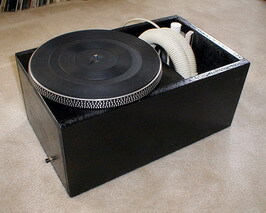 The turntable may also be used as is or it can be integrated into a record cleaner box as I have done. Dremel is ideal for cutting the slot. Line both sides of the slot with velvet. Velvet works better than felt since it retains less liquid. Contact cement works best for attaching the velvet. 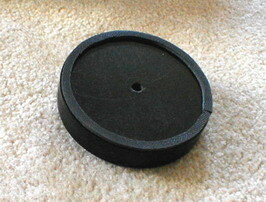 My record clamp is a 4″ circle cut from 3/4″ MDF but other materials could be used. 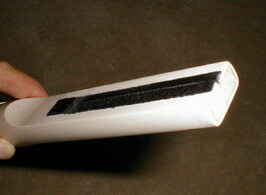 A small plastic equipment foot from my junk bin was used to create a handle for spinning the record. 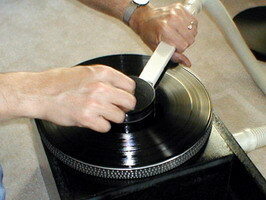 The record clamp needs a rubber grip of some sort to turn the record while it is being vacuumed. A rubber O ring or rubber weather-stripping around the circumference of the clamp provides the needed traction and also keeps the cleaning fluid off of the record label. Having a good clamp makes the cleaning process much easier so don’t cut corners for this item. A threaded clamp would probably work even better for this application if you happen to have a threaded spindle. For the record cleaning fluid I use Laura Dearbon’s formula from her book “Good Sound”. There are a number of other formulas that could also be used. The following is quoted from Laura’s book (without permission, of course). surfacant. Ethyl alcohol, sometimes applied to records in the form of vodka is more damaging to vinyl than is isopropyl. Use it only in an absolute pinch. Drugstore isopropyl contains too many impurities to qualify it for record cleaning. Use technical or lab-grade isopropyl, which is extremely pure. Reagent grade is unnecessary and far more expensive. Water should be steam distilled, triple de-ionized. Both of these are readily available at a chemical supply house, which should sell them to you in pint and gallon sizes. nontoxic – but don’t take them internally – and biodegradable. Very importantly, they leave behind no residue on the record. They are harmless in these small amounts to record vinyl and, as far as is known, to any of the conceivable by-products and impurities likely to be found in record vinyl. Kodak’s Kodaflow is sometimes recommended as a wetting agent. Do *not* use this as it contains chemicals in addition to surfacants that would leave behind residues bad for both record and stylus. Kodak recommends against this application. 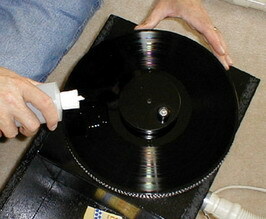 The first step in cleaning the record is putting a small portion of the cleaning fluid on the record surface. A puddle of fluid 2 inches around should be enough. You should use enough fluid to completely flood the surface of the record. 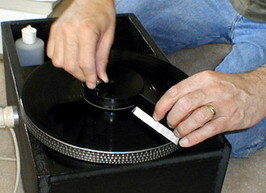 Turn the record clockwise about 10 turns while using the VPI record brush to distribute the cleaning fluid over the surface of the record and into the grooves. Repeat the above for another 10 turns while turning the record counter clockwise. I made this rcm from these specs exactly. Im wondering if the vacuum crevice tool is supposed to touch the record when vacuuming? Of course I have the velvet applied to the crevice tool. It is a little tough to hold the vacuum close to the record without hitting it or being too far away and not sucking any liquid. Any info would be appreciated,thanks. Where can i found the vacuum accesories??? any website to buy these accesories?